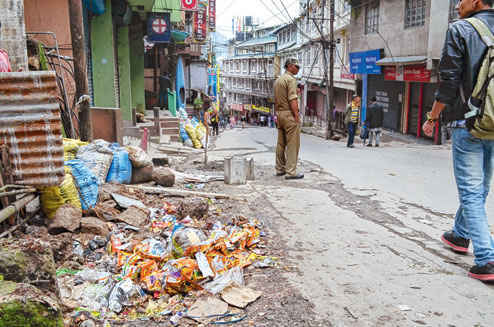 From Tuesday, the Darjeeling Municipality would not allow dumping of garbage in vats after the stipulated time of waste collection by the conservancy department. The municipality has fixede between 6.30 in the evening to 6.30 in the morning for dumping garbage by the public in vats constructed in different wards. There are 32 wards under the Darjeeling civic body. Officials of the civic body said on Monday people had the habit of dumping garbage and wastes throughout the day which was an eyesore and also a cause of concern for health. “The public should dump their wastes only during the time stipulated to them. However, we find that people throw garbage in the vats throughout the day. We want to make Darjeeling clean and beautiful. And the prohibition is part of that effort,” said Darjeeling Municipality chairperson Pratibha Rai. However, the civic body will implement its order in phases. The start will be made in the town area which is a hub of tourism. In the latter phases other wards will be covered. To ensure that people abide by the decision, two municipality commissioners would keep vigil on each of the 11 vats located at various places in the town areas. “People do not heed what we say. Therefore we have asked two commissioners to be present near the vats to stop people from throwing garbage and wastes, “Rai said. Already, the municipality has arranged for pick-ups and other vehicles to with employees of the conservancy department to collect garbage from residents and hotels. However, lack of adequate vehicles is a cause of concern. “We have 14 vehicles to collect garbage and wastes, but only nine of them are in moveable conditions. We will make requisitions and will also be hiring more vehicles to cover all the 32 wards,” Rai said. The municipality also collects an amount of Rs.50 from each house and hotels for its service. Darjeeling Municipality would not allow dumping of garbage in vats after the stipulated time of waste collection by the conservancy department.